VMRO-DPMNE announced its call for no confidence in Interior Minister Oliver Spasovski with a dramatic video outlining all the unresolved murders and the abuse of the police for political purposes under his term. The video is released on a day when an official of the ruling DUI party was shot and wounded in a fight with a rival DUI official and a boy was beaten up in a Skopje bus by the ticket inspectors. – Crime is spiraling out of control. The police is beating its own people and criminals in the Government operate untouched. Patriotic citizens are put in prison and unlawful home searches are rampant. 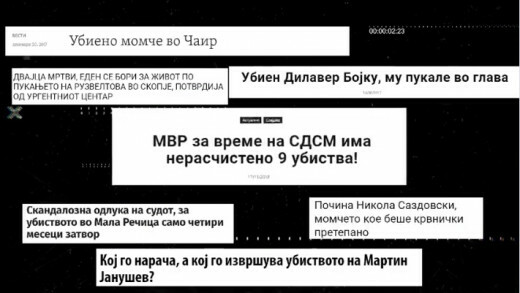 Oliver Spasovski’s dark rule in the Interior Ministry, the political persecution he began, the crime and the corruption, will end, VMRO-DPMNE says in the video. Some of the listed examples include the killing and attempted cover up of 21 year old Nikola Sazdovski by three hooligans from an Albanian football club, police attacks on protesters who oppose the name change, arrests of critics of the Government like Igor Durlovski, illegal procurement of vehicles from SDSM party activists, the beating of a policewoman by a DUI party official who later threatened the woman to claim she hit herself, the release of SDSM mayor in Novo Selo after his arrest for cigarette smuggling, and the threats of the SDSM mayor in Demir Hisar who told municipal employees that as a former police official he has access to their phone conversations.